After the disappointment that was Cities: Skylines' Snowfall expansion, Colossal Order has tried to renew loyalty in the brand by offering free updates and a whole free DLC. Despite my disappointment with Snowfall, I still love Skylines, and I support its developer Colossal Order. They've shown a great deal of good will towards the consumers by offering their game at a budget price, and by continuing to provide exceptional post-release support, maintenance, and improvements to the core Cities: Skylines gameplay. 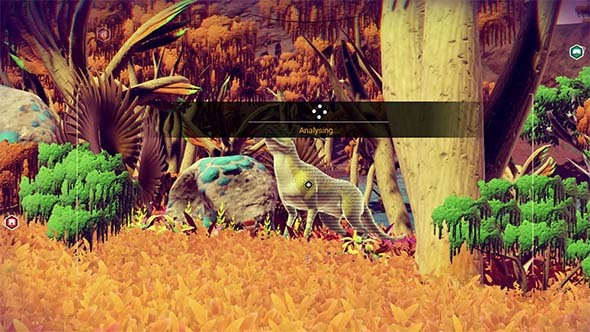 One of the recent major updates added terraforming tools and the ability to create canals. There's also a free DLC called "Match Day", which adds the ability to build a soccer stadium and maintain your own team. Its game day in the city! "Couldn't you already build a soccer stadium?" you may ask. Well, yes you could. 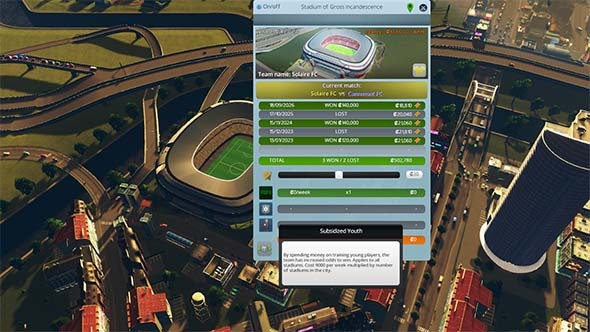 But now there's an additional soccer stadium (which is oddly much larger than the original soccer stadium), and you can inspect it in order to customize your team and set a handful of policies regarding them. If you team wins games (which happen annually in the game's calendar), then your city gets a large lump sum of reward money. You can increase the odds of winning by enacting the various policies. They include making public transit free on game day, hiring private security to keep the peace (you know, soccer hooligans), or [the much more expensive] option to enact a youth subsidy that recruits the best players from the community. Ticket prices are also adjustable, and affect both the income you earn from sales and the attendance and support of fans. You'll also need to provide adequate transit to and from the stadium in order to encourage visitors (including tourists) to attend the games. Your soccer stadium has some limited customization options. Of course, you won't be getting a full-fledged soccer management game. You won't be managing a roster of players, setting depth charts, recruiting new players, or trading players with other teams. This is a city-building game, not EA Sports! I do wish that the stadium had more secondary color customization option in order to personalize it more. It would also be nice if there were multiple stadium architectures to chose from and multiple sports, but I guess we can leave that to the modders. The stadium that was already in the game is still present, but it does not function like the new stadium. 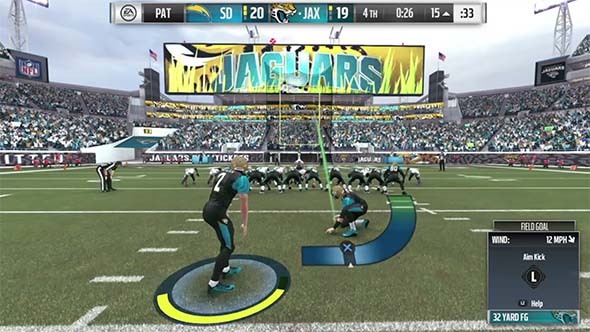 I don't see any reason why they couldn't have moved that stadium into the new "Football" sub-category and make it function the same. Hopefully, it's easy enough to mod, say, a basketball arena that has the same policies attached to it. The Match Day DLC is free, so temper your expectations. It was a long wait to get this DLC on PC and Steam. It originally released back in January on consoles, while we early adopters of the PC version were stuck waiting out in the cold with no clue whether or not we'd ever get the expansion. I wanted to play it, but I was hoping that a PC version would be released because I was skeptical that controlling a shelter full of characters with only an analog stick (and no pause button) would be unweildy. But it finally did get a release on Steam, and was even discounted during the Steam Summer Sale, so there was no way that I was going to pass that up. The base version of This War of Mine is a fantastic game and ranks up there with Papers, Please, Metal Gear Solid 3, and Ace Combat 4 as one of the best games about war that I've ever played. 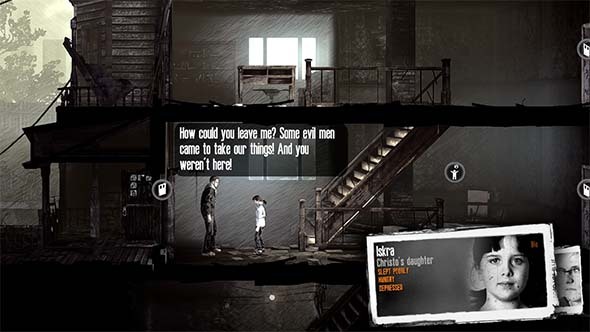 This War of Mine is a very harsh, brutal, and depressing game. But if you didn't think that it was a depressing enough game to begin with, then wait till you play it with children as playable characters! The expansion adds some new scenarios with child characters as well as a handful of child-specific craftable items, but it's surprisingly skimpy on new content. As far as I can tell, there are no new scavenge locations, ambient events, or neighbor events. If the game wasn't already difficult and depressing enough, now you have to keep children safe as well. Children can be both a burden and a blessing in this game. By default, they can't perform most crafting, they can't shovel away rubble or unlock blocked doors, they can't be sent out to scavenge at night, and they can't do anything to guard or protect the shelter from raids. At the start, they are basically just extra mouths to feed that have the potential to consume more of your valuable medicines and bandages, but they can't contribute directly to your survival. They can also be particularly needy, and their needs can be tough to meet as you struggle just to get the basics like food, water, and an assembly line of crafting stations. Since I'm in between major releases, it's time for yet another indie Steam game. This time, it'll be a game that was released this year! Only a few weeks ago, in fact! I picked up Room 404 (along with a couple handfuls of other games) in the Steam Summer Sale a couple weeks ago. 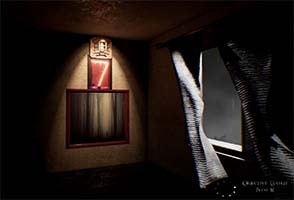 It's yet another attempt to scratch that horror itch that was left behind by the cancellation of P.T.. Room 404 completely failed to scratch that itch. There's really not much to this game at all. It's only a couple hours long and isn't very mechanically or intellectually substantive. It falls firmly into the category of "walking simulator", and even that might be generous. There's basically three types of puzzles that get re-used throughout the game - if you can call them "puzzles", that is. All of them are resolved by simply exploring the linear areas to find the triggers to solve the puzzle. Numeric keypad locks are opened by searching adjoining hallways and rooms for the numbers that make up the combo, which are hidden in plain sight or in obvious locations. If you're not looking for keypad numbers, then you're looking for simple keys. 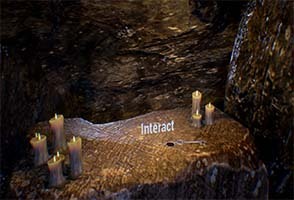 The second puzzle type involves simply lighting candles in the right order. The final puzzle (which only appears once) puts you in a tiny maze and shows you a map that highlights your current location and the location of the exit. You turn three corners, and you're done. Some of these puzzles are made a little bit confusing by the game's only real feature: its changing landscape. 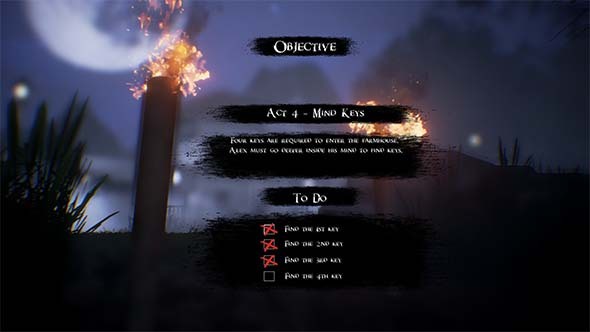 At several points in the game, you'll come across a locked door or obstacle, which will force you to turn around to find that your environment has changed. In some cases, this will mean that another door will suddenly be open, allowing you to explore a previously-closed off room. In other cases, you simply turn back around to find the obstacles gone. These situations are always accompanied by an audio cue to notify you that something has changed, and the sound of a creaking door will often notify you to go back and check previously-closed doors. In other cases, it's not always obvious what you're supposed to do, and I swear at least a couple puzzles were solved by my simply turning around in circles a couple times wondering what the heck the game wanted me to do. Puzzles don't get any more complicated than finding keys and numbers hidden in plain sight.